Note: This article talks about the Core Data (via Magical Record) so I’m assuming that you are already familiar with it or at least you know the basics. If this it is not the case you can find very good tutorials on the Tim Roadely’s blog or on the Ray Wenderlich’s blog. Note 2 (october 2012): The article has been updated to work with the MagicalRecord version 2. If you have already work with the Core Data framework you probably found this hard to learn. When you start you have to understand what is the role of each components (NSManagedObject, NSManagedObjectContext, NSManagedObjectModel, NSPersistentStoreCoordinator, etc.) and how they work/communicate between them. Once you understand the principle, you notice that the code is not easy to do too. There is a tons of line of code to manage and it becomes a nightmare when you have to work in a multi-threading context. Here comes the very useful open-source project named Magical Record. This post is intended to give an introduction to using the Magical Record project by showing and explaining you some code snippet extract from a little project which is available here. The Active Record fetching implemented in this project comes from the Ruby on Rails’ principles in order to provide a clean and light code. 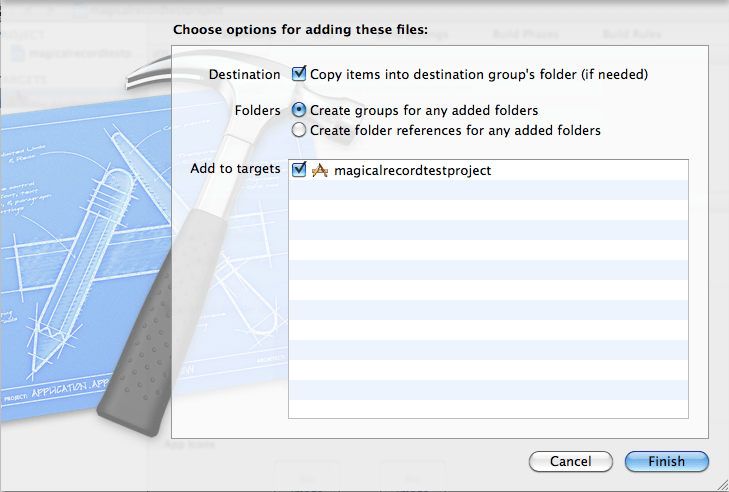 Before to show you how works Magical Records we are going to explain you how to “install’ it into your project. Make sure that the project compile correctly! So now that you know how to install it, we are going to define a simple model to illustrate the Magical Record features. As part of this article we need to create a model to illustrate the operations provide by the Magical Records project. The model that we are going to build is simple entity named “Person” with an age, firstname and lastname as attributes. We now have our model and we can work with the Core Data framework and more specifically the Magical Record. 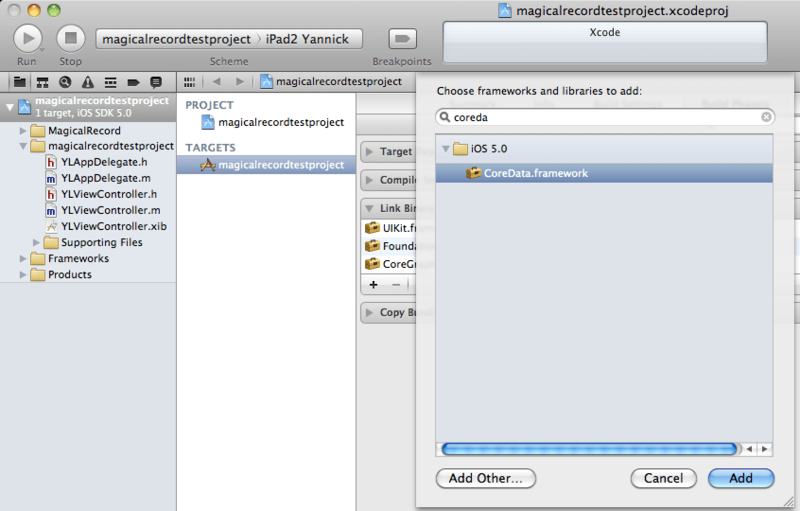 In this part we are going to explain you how to work with the Core Data framework by using the Magical Record project. Returns the managed object context for the application. If the context doesn't already exist, it is created and bound to the persistent store coordinator for the application. 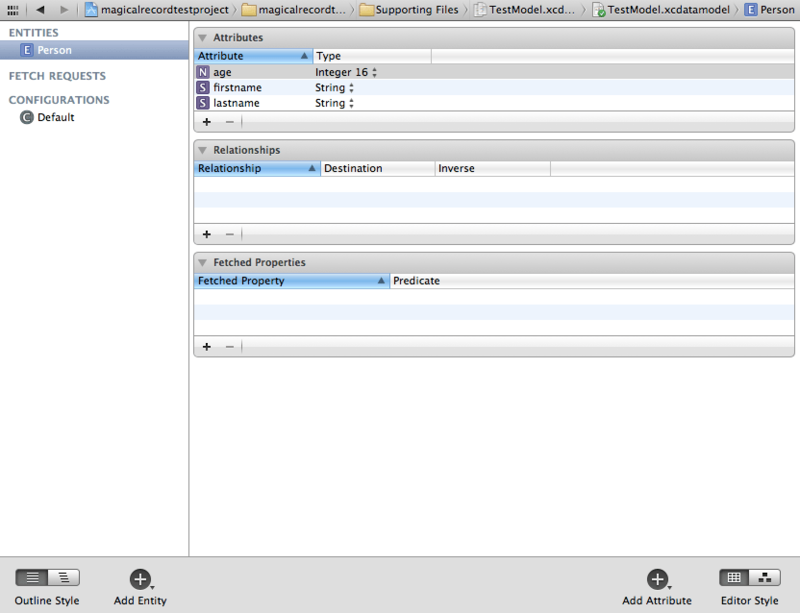 Returns the managed object model for the application. If the model doesn't already exist, it is created from the application's model. Returns the persistent store coordinator for the application. If the coordinator doesn't already exist, it is created and the application's store added to it. Returns the URL to the application's Documents directory. That does not really want to delve into it. However, this code is something simple because it just instantiate Core Data with its model and the data layer. It looks more readable, no?! These 2 lines will hide all the previous boilerplate by creating the NSPersistentStoreCoordinator (linked to the “MyDatabase” sqlite database), the NSManagedObjectModel and the NSManagedObjectContext. As you can see we Magical Record provides a static method for the NSManagedObject which allow us to create a new entity in a very convenient way. In this example, I willingly retrieve the local managed context because if you work in a multi-threaded environment it will avoid inconsistent/concurrent errors. To finish, we don’t forget to save the person into the database! It exists a lot of other convenient methods to retrieve the data, I invite you to check the API. Once you have fetched an object from Core Data, updating it is easy. As always, remember to save the context. With Magical Record, you can focus on your entities and how they’re useful in your application and do not worry about the Core Data boilerplate code needed. This is because Magical Record hides a lot lower mechanism to developers and it is based over the Active Record Pattern which is a more convenient way (in my opinion) to work with datas. And even though Magical Record revolves around a simple concept, it’s incredibly powerful, in particular in a multi-threaded environment by providing a high abstraction level to avoid the headache. Before to finish you can find here an example project which summarizes what has been said in this article. I hope it will help you. If you have any question, contact me or leave a comment! One thing as an aside, I really wish the authors of this framework would correct their usage of the word “Entity” and not use it interchangeably with “ManagedObject”. “Person” is an Entity, but when you create a Person, you are creating an object, not an entity. Similarly, at run time you would not update “entities” but rather objects. One would not randomly throw around the word “Class” the way they are throwing around “Entity”. If I have a Car class, myCar is not a Class, it is an object of type Car. Anyone tried implementing this into a project that already had coredata in it? I’ve got a new project I’ve been bashing my head against a wall with – it’s already started with CoreData. How hard would it be to get rid of my existing coredata code and implement this? Excited to try because I feel it would perfectly fit my needs.